It’s the weekend again! 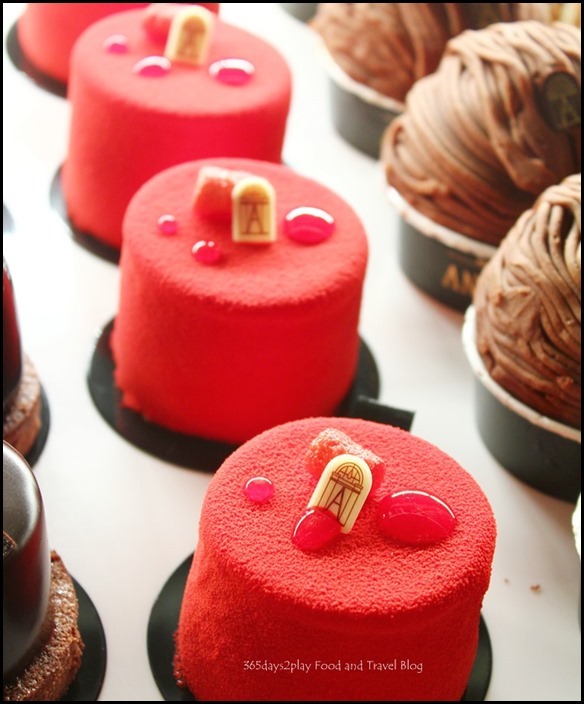 And since it’s the weekend, I thought I would write about one of my favourite topics, having Afternoon Tea! 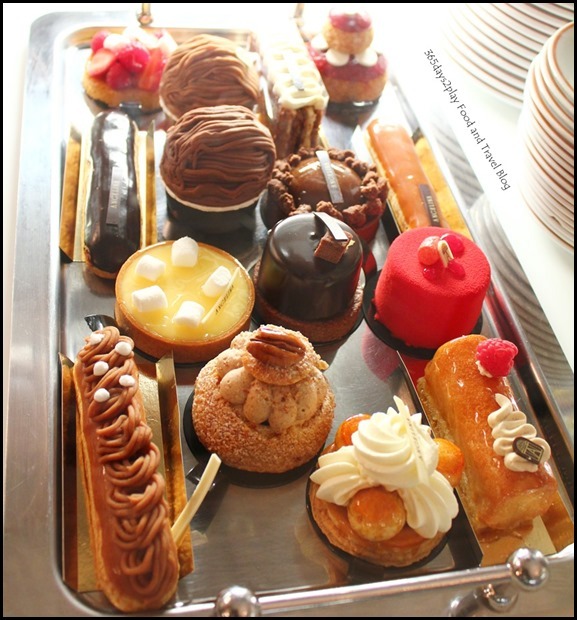 Actually I had this a couple of months back when I was in Paris. 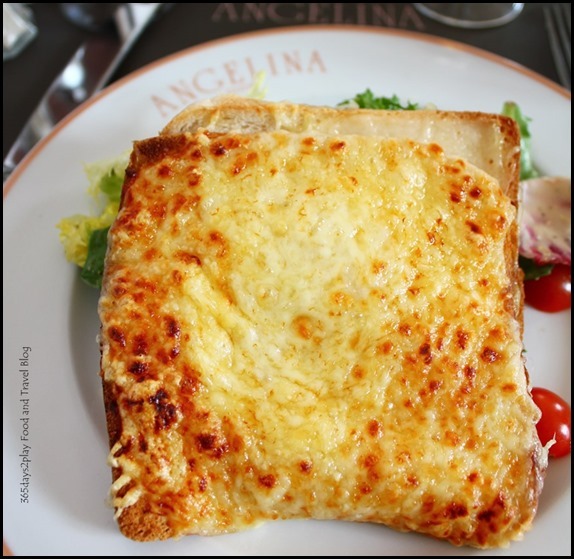 The Angelina Tearooms are famed in France, having been established way back in 1903. 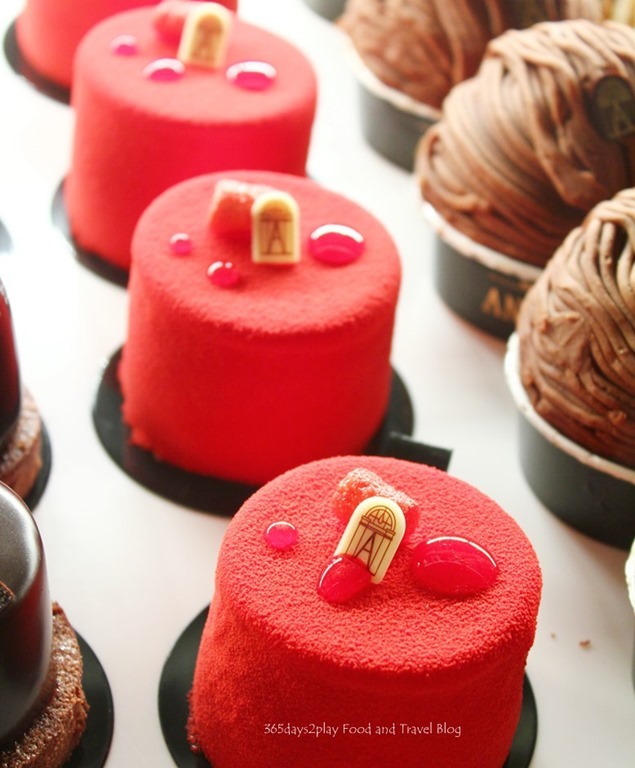 Apparently, Austrian confectioner Antoine Rumpelmayer established Angelina and named it after his daughter-in-law. 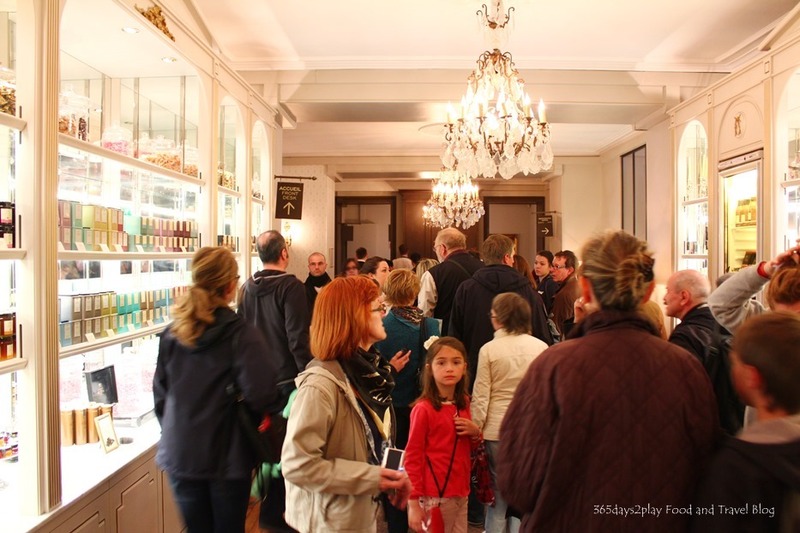 It soon became a must-visit venue for the Parisian aristocracy. 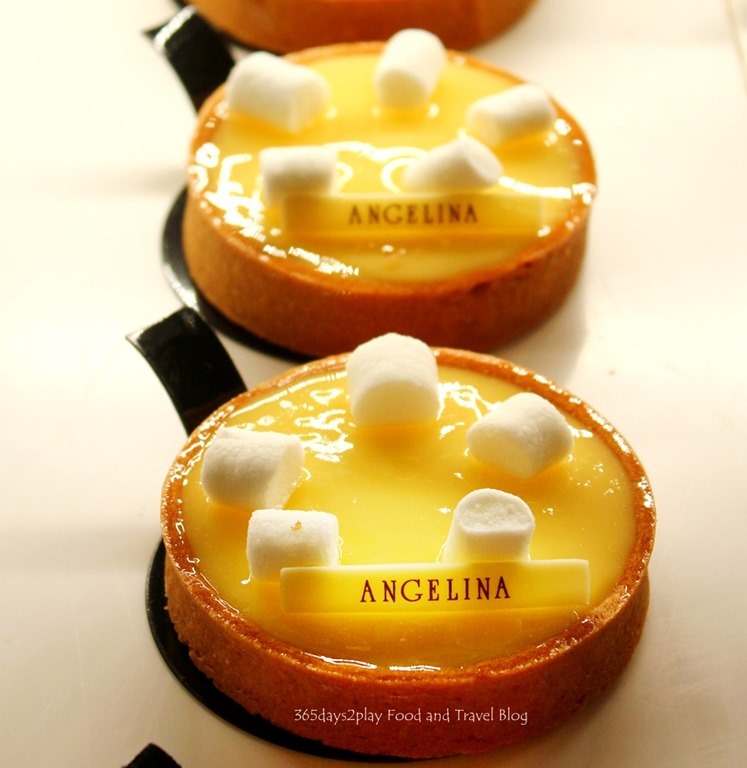 Proust, Coco Chanel and all the greatest French fashion designers used to visit Angelina. With such an illustrious history, how can I not visit Angelina? If I had just brought along my laptop, I might just be able to squeeze out a novel just like Proust! 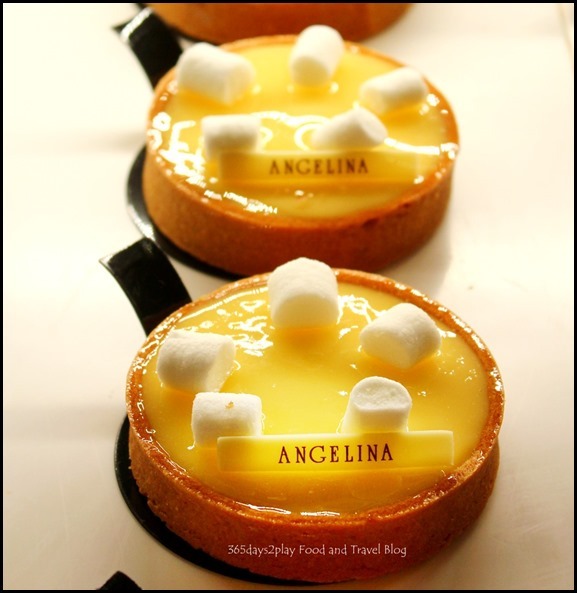 One of the first things that attracts you when you arrive at Angelina is the eye-popping dessert display. And of course, one must not forget the famous hot chocolate! Chocolate eclairs drizzled with caramel and berry tarts with marshmallows and an Angelina white chocolate piece! 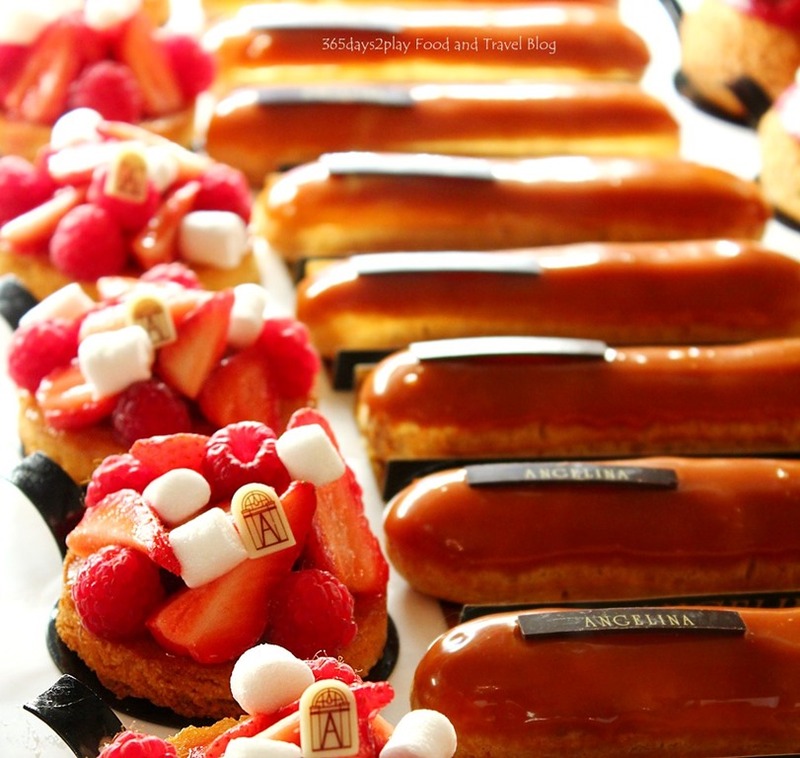 It’s actually not any more expensive than the pastries you can get in Singapore. Perhaps it was the good Euro to Sing dollar exchange rate, but I really don’t think Paris / France is as expensive as everyone says. 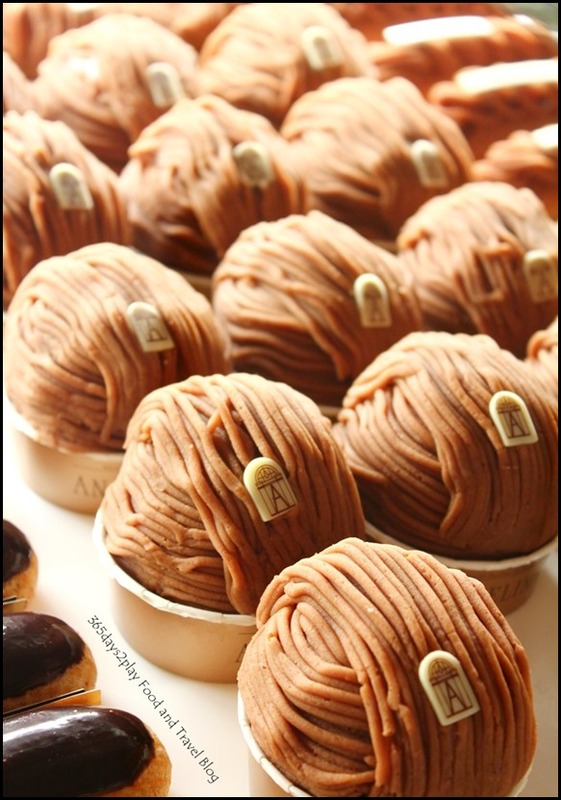 The famed Mont Blancs combining meringue, light whipped cream and chestnut cream vermicelli. Up to 600 are sold every day in the historical tearoom at Rue de Rivoli (Rivoli Road)! 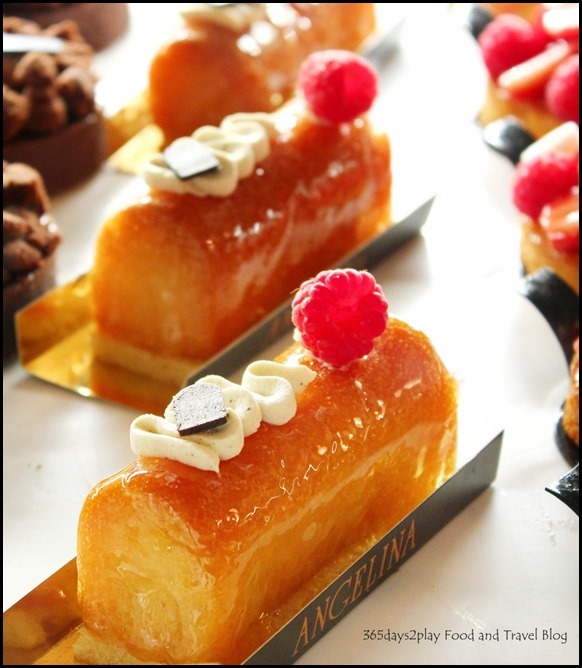 Citrus and amber rum syrup soaked baba, vanilla mascarpone whipped cream … oooh la la! 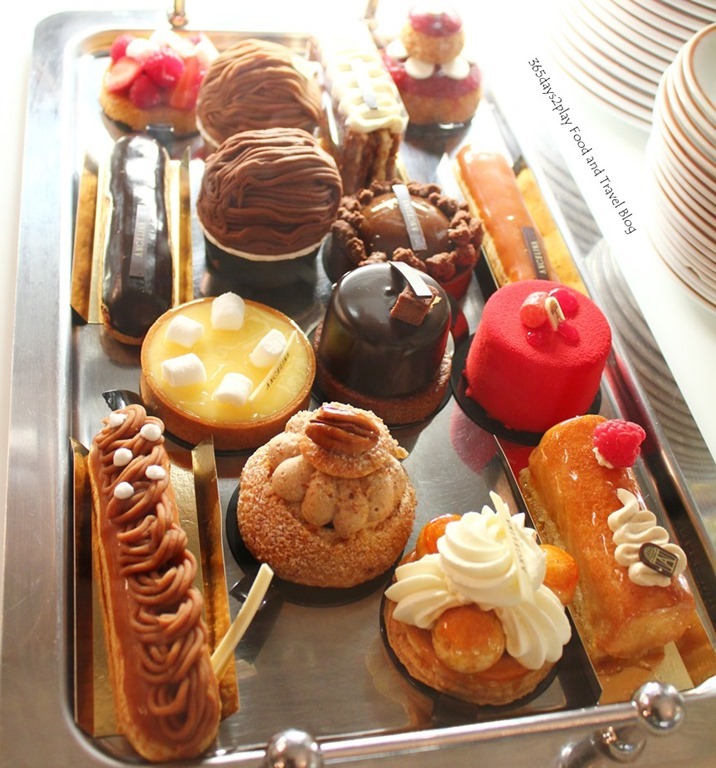 Ah what the heck, order the whole tray will you, s’il vous plait! The famed hot chocolate. Order it the French way by calling it Le Chocolat Chaud a L’Ancienne, which means Hot Chocolate the old-fashioned way. Comes with a little pot of whipped cream. I must warn you, this hot chocolate is extremely thick. It is so thick, it is like drinking pure melted chocolate. I couldn’t imagine finishing the entire thing on my own. I had to ask for a glass of hot water to sort of dilute the chocolate. I was told by my friend who also happened to visit Paris at the same time as I did that all the cafes she went to in Paris served hot chocolate like this. 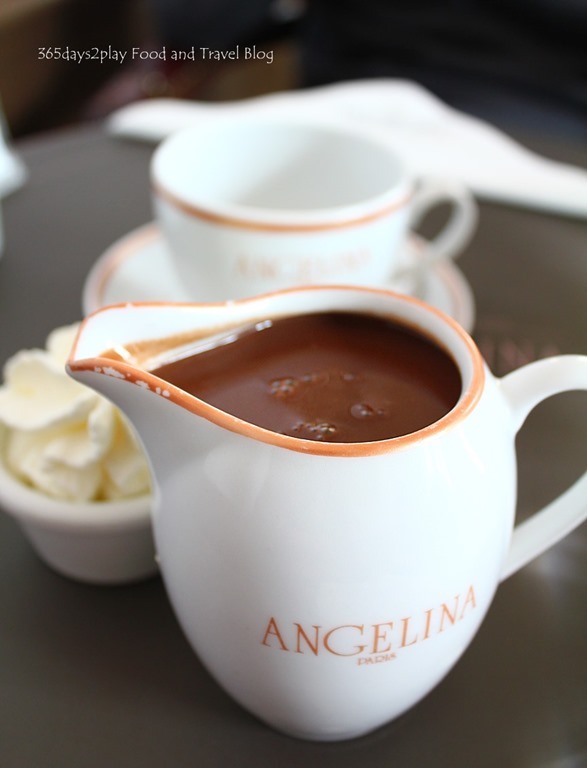 The strange thing is, I had hot chocolate numerous times in other parts of France and including Paris, and Angelina was the only place where the hot chocolate was this thick. 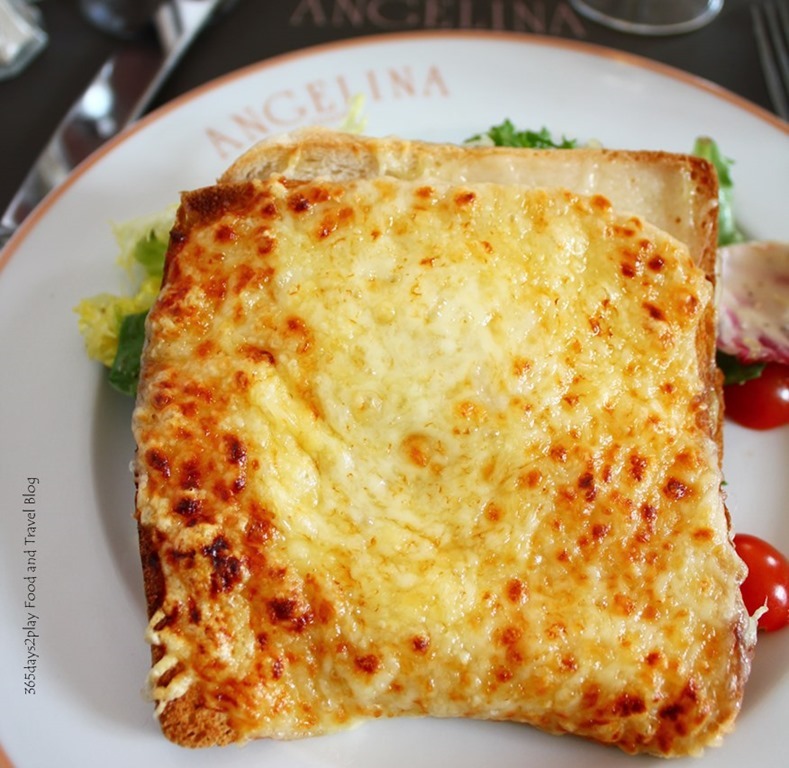 There are a number of Angelina Tearooms in Paris, as well as one in Lyon. The original one is the one opposite the Tuileries Gardens, at Rue de Rivoli. 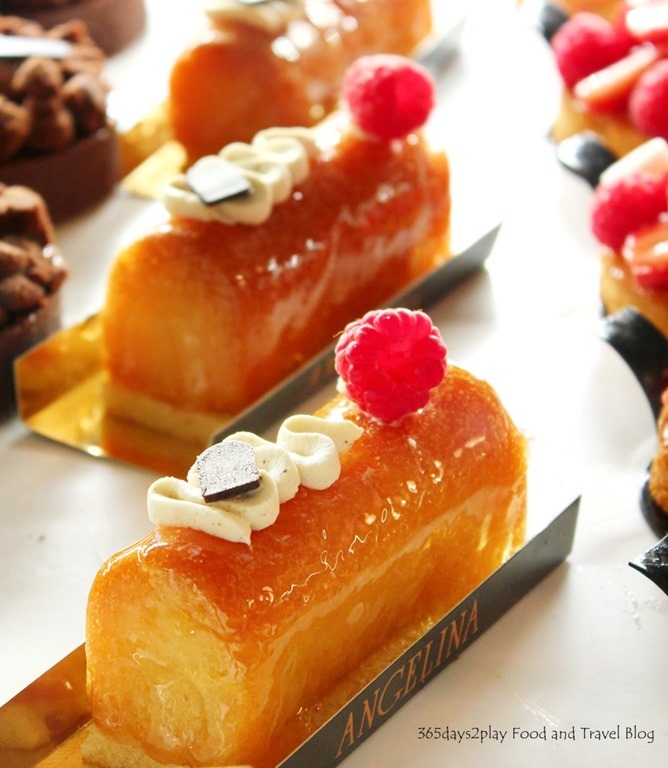 However, we went to the one at the Versailles. 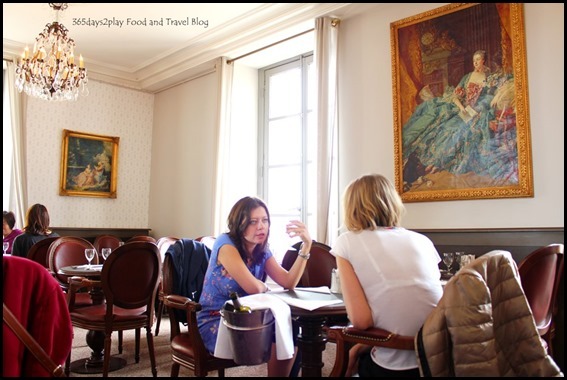 It felt good to dine at Versailles, felt as if we were Royalty dining in a Palace. And we were technically dining in a Palace! 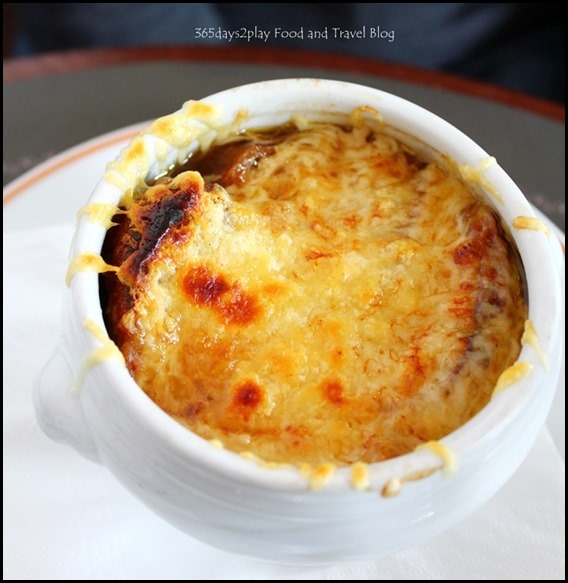 We also tried the French Onion Soup which was FANTABULOUS! 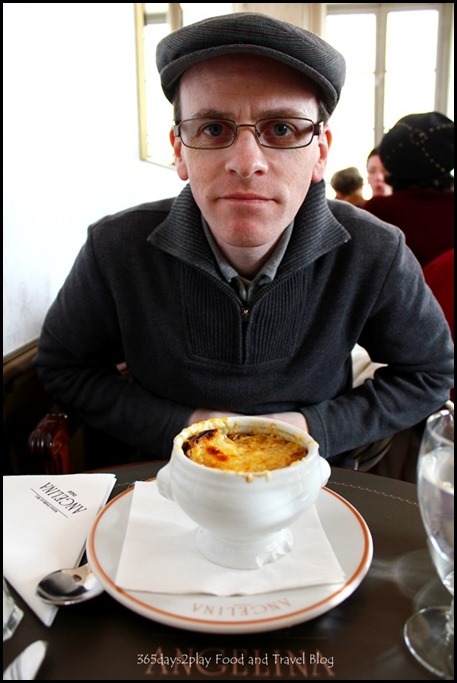 First of all, after the arduous task of lining up for 2 hours in the cold winds just to gain entry into the Versailles, it was good to have hot soup to savour. Plus the generous amount of cheese and bits of bread soaked in oniony broth, it was a great meal. 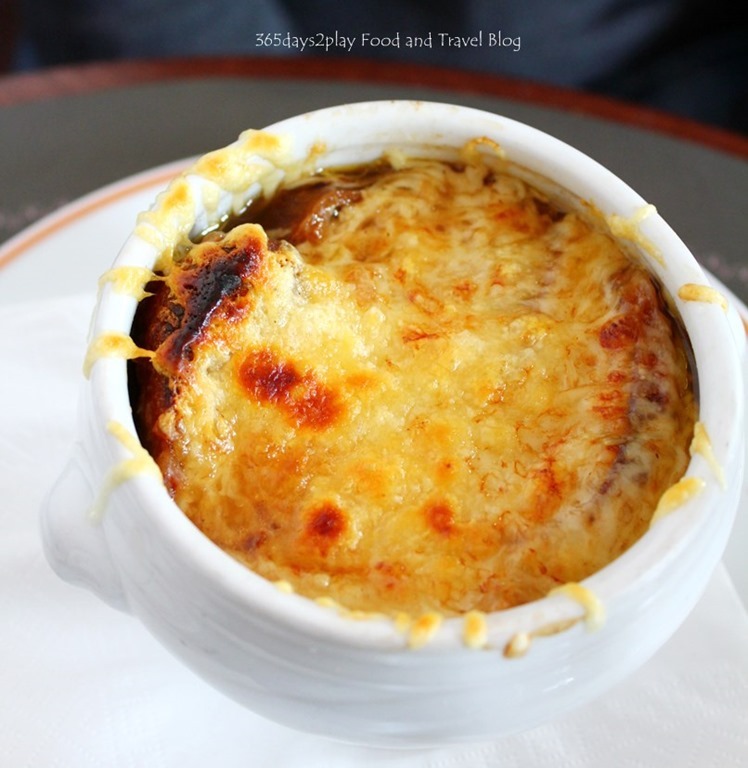 I managed to find a good French Onion Soup too in Singapore from Jewel Cafe & Bar. Too bad it’s not in the most convenient of locations or else I would be having it more often! 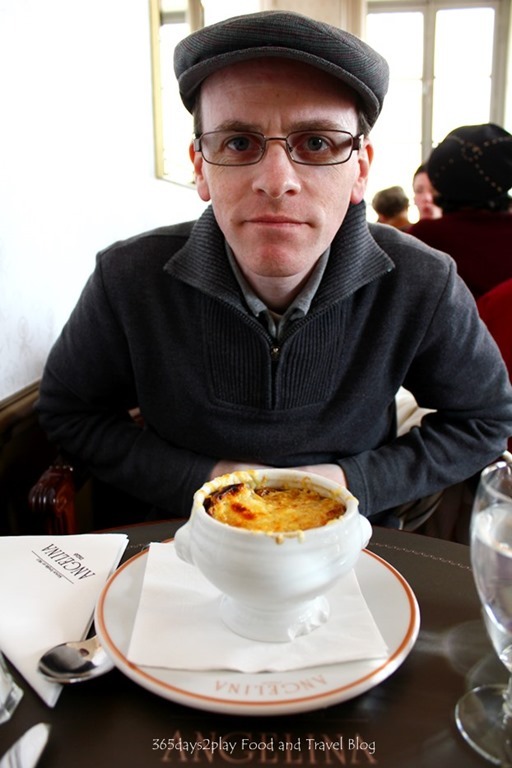 Any ideas on where to get good cheesy French Onion Soup? Frenchman having French onion soup. « National Day Fireworks 2013!